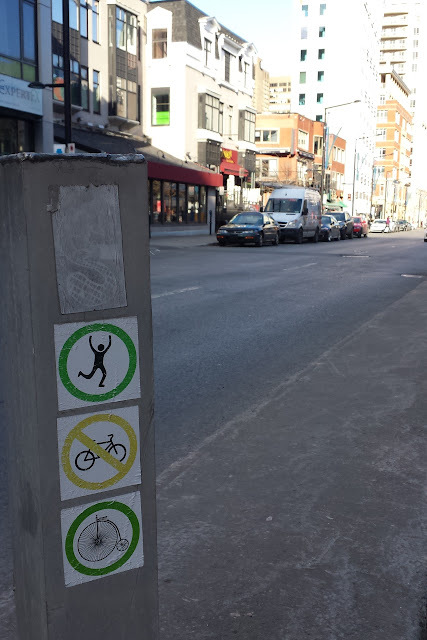 I think they mean to say, cyclists should follow the signals for vehicles, not pedestrians. Which is what you do, and we all should, all the time. But not everyone does. thank you Jon and Jon, and especially for teaching me the Barnes Dance. I regularly dismount and push my bike across Penn at 6th during the Barnes Dance part of the cycle. Hey, I’m a pedestrian, I can walk across the street, right? I’m just pushing a bicycle while doing that. I don’t see anything wrong with that. I don’t see how anyone else could find anything wrong with that, either. Multiple vehicles parked in the lane near the Convention Center, yesterday, at around 1PM. Would’ve taken pics, had I had my phone with me. U-Haul truck and some workers doing some type of cement work on the sidewalk, apparently. I should have called 911, but this guy was insane, so I grabbed a drink of water and waited for him to leave, as well as the RV to get out of the lane. This begs the question though, the city wouldn’t be stupid enough to allow Heinz Hall to have a permit to park there would they? Also, aside, there are ASL boxes being installed at Penn and 7th. BTW, 311 is not a sort of mini-911. If you see somebody violating the law and you want the police to issue a ticket, call 911. 311 is for things like potholes you want filled, or bike lanes cleared of debris, etc. It is the way to access city maintenance. There’s no point in calling 311 for illegal parking; it’s only going to delay things, if it makes its way through the system at all. P.S. Picture of the vehicle in question. I’m actually okay with Heinz Hall blocking the bike lane to load or unload…so long as they set up sawhorses (not just cones) to block the leftmost inbound lane of Penn and route the bike lane around the truck/bus/RV. If that’s too much trouble, then they should probably just park elsewhere. Bummer. I was curious to see how much use it was getting during the winter. But I guess those counting strips wouldn’t survive if a snow plow passes scraping the road. Or maybe the Pittsburgh Downtown Partnership doesn’t want to show the data? Will the cameras still be running? Can we get some sort of automated counter to analyze camera footage? Partly prompted by Stu’s question, I asked Envision Downtown if they would continue to collect data by some other means (after business hours, probably, on Friday; at any rate, no answer yet). Will update when/if they respond. @envisiondwntwn Are there alternate means available that'll be used for tracking usage during the winter? Of the six shown, five are new. The one in front of the O’Reilly Theater vexes me. I hate these art racks, they dont’ scream “I’m a bike rack, lock to me”, and some of them are really terrible at the job of being a bike rack. What I want to see is pictures of these racks at capacity with bikes locked Properly with frame ulocked and at least a single wheel cable locked with an accessory cable. I think it would be nice to have a plaque on the ground that indicates the name of the artist, the name of the sculpture/rack (if there is one), and a little blurb that says “Cultural District Bike Racks”. That would make their purpose more apparent. But yeah, a couple of these are seriously lacking in functionality. Cool. Having signs that indicate them as bike racks, and identify the artist is a nice improvement. It makes them less ambiguous. Still not as enthusiastic about them, but I’ll take it down from hate to dislike. 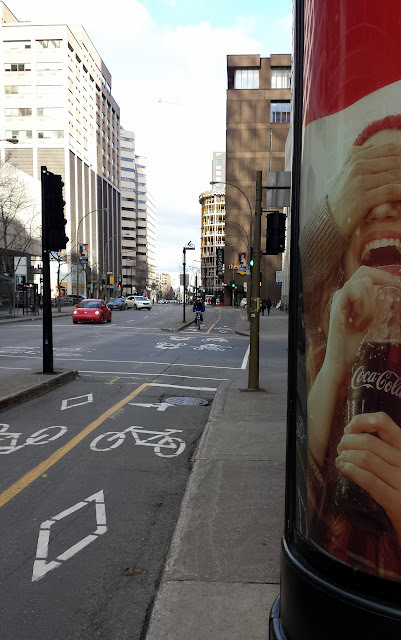 I was in Montreal for a few days and snapped some bike infrastructure pics. Some streets have bike lanes separated from cars by a raised median. Safer than bollards. It includes discussion of bike lanes such as Penn Ave.
At 5:10, a caller from Healthy Ride points out that 20 bikes can park in the same space as 2 cars. The Wexford caller also complained about loss of parking around Phipps. I recall that some parking spots were removed, but there’s still parking along Schenley Dr leading up to three-way intersection. I guess she wants all the parking! People from Wexford loathing downtown EVEN MORE because of bike lanes = win/win for bike lanes. 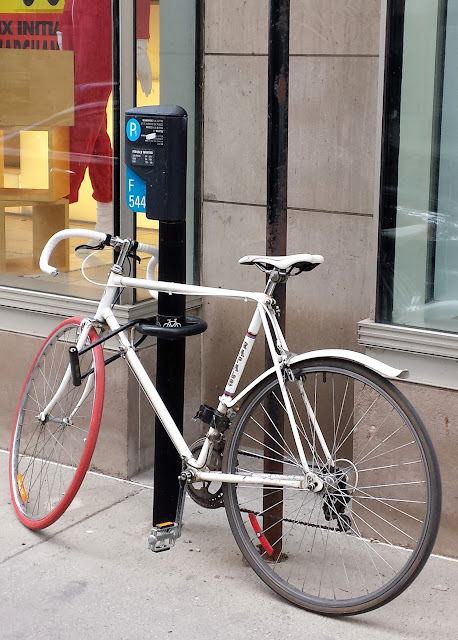 The bike-counting devices have been reinstalled, I noticed one this morning around 9th St. Seriously though, judging by the number of bikes I see locked up on the newer art racks between Garrison Pl. and 10th St in the evenings, I’d say the bike lane is getting plenty of use. The other two counters (600 block and 1200 block) are now in place as well. Make your trip count, yinz!